You've heard the saying, "sit down on your punches" but having a hard time understanding what that means? 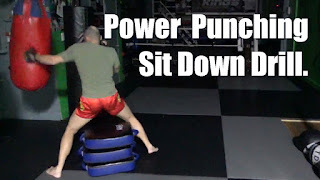 Add this drill to your training so that you can get a feel for "sitting down on your punches". Yes it looks like some sort of Big Booty Boxing Circuit, but this drill will help in a few ways. Forces you to engage your legs when punching. 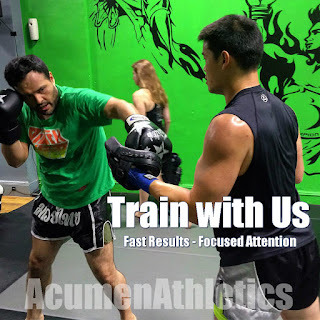 "sit down on your punches"
Eliminates arm punching. Since you are closer to the bag, you will need to focus on hip rotation and pivoting the foot for power shots. Will give you a big booty. Stand at about jab distance from the bag & sit on a chair or a stack of kick shields. With a slightly wider stance, stand up & throw your combos w/power! Make sure to engage your hips, legs, abs & pivot your feet for more power. Use long guard to control the bag on the return & to stabilize your sitting position. Try this drill out, share it with your teammates and let me know your experience.